Introduction : Critically ill patients are common in emergency medicine, and require expert care to maximize patient outcomes. However, little data is available on the provision of critical care in the ED. The goal of this study is to describe the management of critically ill patients in the ED via a survey of Canadian emergency physicians. Materials and Methods : A survey of attending physician members of CAEP was conducted by email. The survey was developed by the authors and internal validity was established prior to survey deployment. Data on physician demographics, hospital resources, use of invasive procedures, vasopressor/inotropic medications, length of stay in the ED and patient responsibility were assessed. Results : The survey response rate was 22.9%, with the majority of respondents possessing speciality training in EM (73.5%). Respondents indicated that critically ill patients were commonly managed in the ED, with 68.5% reporting >6 critically ill patients per month, and 12.4% indicating > 20 patients per month. Respondents indicated that the majority of critically ill patients remained in the ED for 1-4 hours (70%) after resuscitation, yet 18% remained in the ED for >5 hours. Patients with a "respiratory" etiology were the most common critically ill patient population reported, followed by "cardiovascular", "infectious" and "traumatic illness". Direct laryngoscopy was frequently performed (66.9%> 11 in the year prior to the survey) in the year prior to the survey, while other invasive procedures and vasopressor/inotropic medications were utilized less often. EM physicians were responsible for the management of critically ill patients in the ED, even after consultation to an inpatient service, and were often required to provided acute care to critically ill patients admitted to an ICU, yet remaining in the ED prior to transfer (20% reported > 50% of the time). Conclusion : Our survey demonstrates that critically ill patients are common in Canadian ED's, and that EMP's are often responsible to provide care for prolonged period of time. In addition, the use of invasive procedures other then direct laryngoscopy was variable. Further research is warranted to determine the impact of delayed transfer and ED physician management of critically ill patients in the ED. The care provided in the initial phase of critical illness dramatically impacts on their survival, with rapid diagnosis and stabilization improving both morbidity and mortality in this patient population. ,,, Emergency physicians are often challenged to recognize, diagnose, and institute life-saving therapy in a simultaneous fashion. However, timely and expert resuscitation in the ED may be the most important care these patients receive in terms of impact on patient survival. ,, Alternatively, delayed resuscitation may allow progressive and irreversible physiologic instability, which results in increased organ dysfunction and mortality. In addition to resuscitation and stabilization, emergency physicians may be charged with the provision of post-resuscitation care, as acute care in-patient beds are often unavailable in the current heath care environment. ,, This presents unique challenges to emergency physicians and other healthcare members, as some management principles in the post-resuscitation phase, including ventilation strategies, vasopressor use and invasive procedures may be beyond the training and skill set of many emergency physicians. Despite this, little data is available on the provision of critical care in the ED. The objective of this study was to describe the management of critically ill patients in the ED via a survey of Canadian emergency physicians. Specifically, we sought to determine the frequency of critically ill patients in the ED; the length of ED stay; responsibility of critically ill patients in the ED; and the frequency of use of invasive procedures and vasopressor medications by emergency medicine (EM) physicians. We conducted an e-mail-based survey of all attending physician members of the Canadian Association of Emergency Physicians (CAEP). An invitation to participate in an electronic web- based survey (SurveyMonkey® ) was distributed utilizing the CAEP official email list on 3 separate occasions over a 10 week period commencing in August of 2005. Residents, medical students and non-practicing physicians were not eligible for this survey, and any responses by one of these groups were removed prior to analysis. The survey was deployed in a blinded fashion to 1328 physician members of CAEP, and quality control mechanisms were in place to only allow respondents to complete the survey on a single occasion. The study protocol was approved by the Capital Health Research Ethics Board, Queen Elizabeth II Health Sciences Center, Halifax, NS. The survey was developed through an iterative process among the investigative team, with input from other experts in EM, critical care medicine (CCM), and research methodology. We asked respondents to answer questions with reference to their primary ED practice over the year prior to the survey. Survey data included respondent demographic data, hospital resources availability, physician experience with various invasive procedures and vasopressor/inotropic medications, patient length of stay in the ED, and who was responsible for critically ill patients while in the ED. The frequency of use of invasive procedures and vasopressor/inotropic medications were categorized into "never", "1-5," "6-10," "11-15," "16-20," and ">20" per year. The survey was piloted in a test/re-test fashion with 15 attending physician members of the Queen Elizabeth II, Department of Emergency Medicine. Descriptive statistics was carried out using SPSS 15.0 statistical software (SPSS Inc) to describe the survey respondent population characteristics and institution characteristics. Descriptive statistics were used to determine percentages based on only questions answered by respondents. Unanswered questions were not included in the analysis of that question. 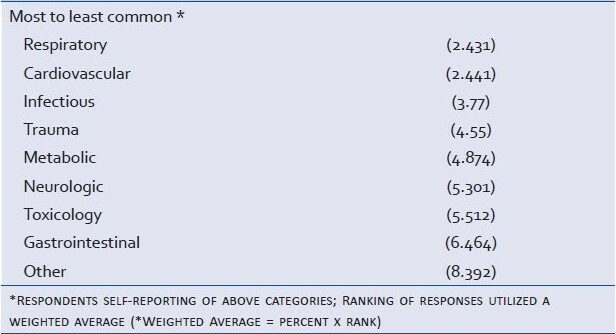 Ranking of categories of critical illness and consultant assessments were calculated by the use of a weighted average (percent x rank). The respondent rate for this survey was 22.9%. Physician demographic data reported by respondents is outlined in [Table 1]. The majority of respondents were less than 45 years of age (67.7%), and 73.5% were male. 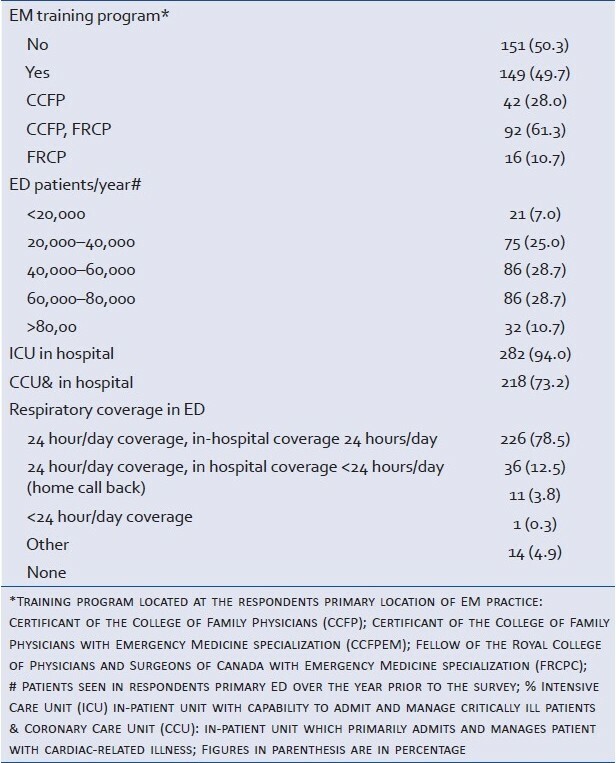 Most reported EM speciality training [79.7%, Certificant of the College of Family Physicians with Emergency Medicine specialization (CCFPEM) 49.5%, Fellow of the Royal College of Physicians and Surgeons of Canada with Emergency Medicine specialization (FRCPC) 27.9%, American Board of Emergency Medicine (ABEM) 2.0%, Pediatric Emergency Medicine specialization (PedsEM) 0.3%, and a median of 14.5 years since completion of their training. Respondents also reported that critically ill patients were common, with 44.9% indicating that they manage >11 critically ill patients per month. [Table 2] summarizes the reported ED characteristics and hospital resources. The majority of physicians worked in an ED with a census of >40 000 patients per year (68.1%), and had an intensive care unit (ICU; 94.0%) and Coronary Care Unit (CCU; 73.2%) located in their hospital. Respiratory therapist coverage (24 hour/day, in-hospital coverage) was common (78.5%), as was the presence of an ED training program (49.7%). The survey asked respondents to rank categories of critically ill patients which they had managed over the previous year in the ED [Table 3]. Patients with a "respiratory" etiology was the most common critically ill population in the ED, followed by those with "cardiovascular", "infectious" and "trauma" illness. 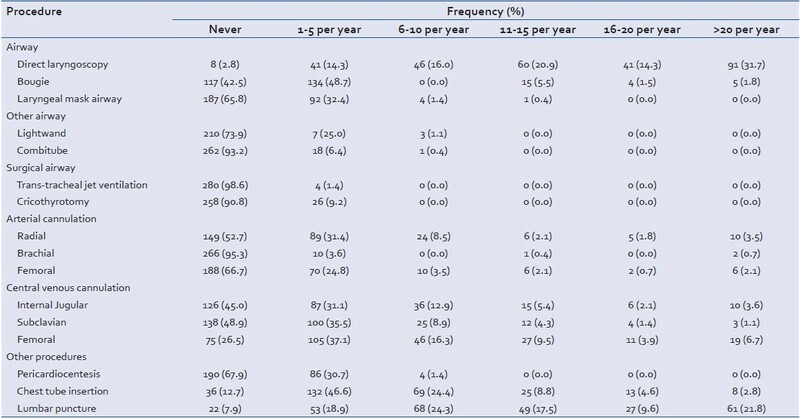 The frequency of various invasive procedures and vasopressors/inotrope medications used by respondents in the year prior to the survey are outlined in [Table 4] and [Table 5]. Emergent airway management with direct laryngoscopy (DL) was reported being frequently performed (66.9% >11 DL per year; 31% reporting >20 DL per year), compared to other intubation procedures. Central venous cannulation (CVC) was performed less frequently (26.5-48.9% reported "never" inserting a CVC in either the internal jugular, subclavian, or femoral veins); with the femoral vein the most common site utilized when this procedure was performed. Similarly, arterial cannulation was reported as being infrequently performed by emergency physicians in our survey. When asked about the frequency of vasopressor and inotropic use in the previous year, dopamine was the most commonly utilized vasopressor [Table 5]. However overall, vasopressor and inotropic medications were not reported as being frequently used. When asked about colloid administration in the ED, synthetic colloids (hydroxyethyl starch solutions) were reported as being more frequently used compared with albumin. After consultation by the EM physician, critically ill patients were most commonly assessed by attending intensive care physicians, followed by ICU residents and clinical associates. 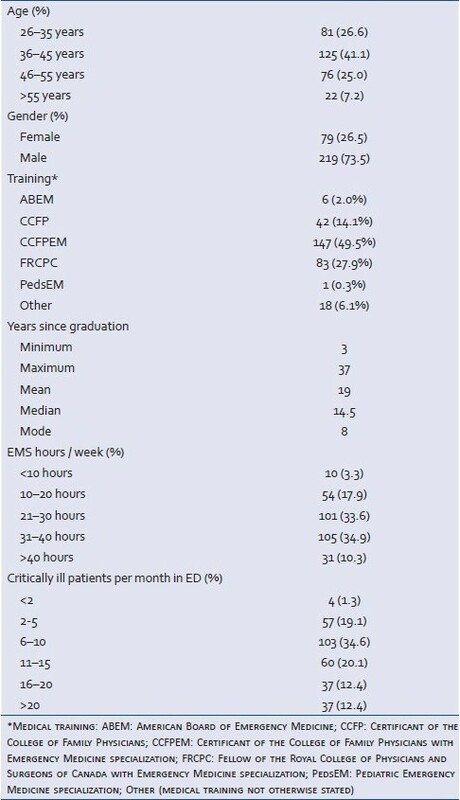 [Table 6] Respondents indicated that most critically ill patients remained in the ED for 1-4 hours after resuscitation (75.1%), with 18.2% of respondents reporting that patients remain in the ED for >5 hours. EM physicians were responsible for patient care in the majority of cases, either solely (21.3%) or in combination with another service (49.8%). 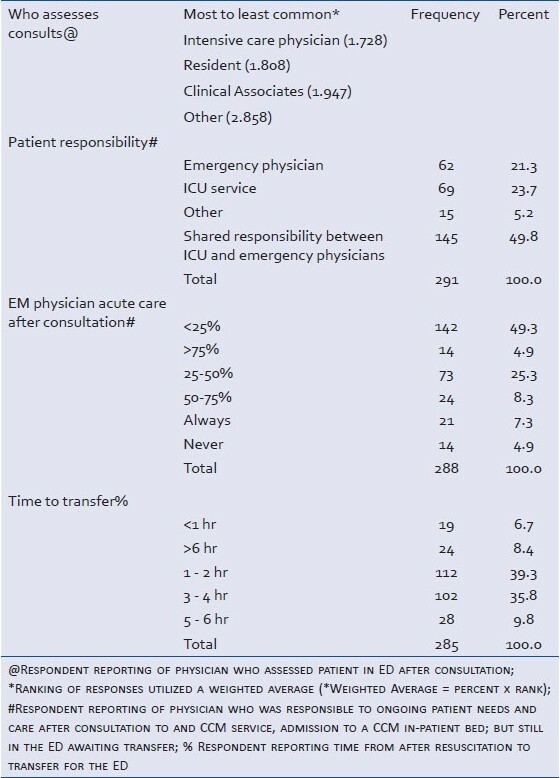 In addition, EM physicians frequently provided acute care to critically ill patients admitted to an ICU, yet remaining in the ED prior to transfer (20.5% >50% of the time). We have found that Canadian emergency physicians provide a substantial amount of care to critically ill patients. Based on the data provided by our respondents the majority of these patients remain in the ED for 1-4 hours awaiting intensive care unit admission, with EM physicians often providing ongoing care after consultation. Respondents also indicated that some invasive procedures, such as direct laryngoscopy, were frequently performed in the past year, while others such as central venous and arterial catheters were utilized less often. Despite the location of resuscitation, critically ill patients often require the performance of invasive procedures and the use of vasopressors/inotropic medications to optimize patient outcomes. , Specialists in EM and CCM share this knowledge base and skill set, yet little data exists of the use of invasive procedures in these two medical disciplines. Our survey suggests that relatively few Canadian EM physicians had performed invasive procedures or used vasopressor/inotropic mediations in the year prior to the survey. However, it is not possible to determine if the use of invasive procedures and/or vasopressor/inotropic medications was sub-optimal based on this survey. Regardless, it is somewhat surprising that respondents reported the use of relatively few of these management strategies given how common they reported managing critically patents. Further investigation in this area is warranted to clarify this issue. The goal of this survey was to describe the frequency of critically ill patients in the ED, the length of ED stay, responsibility of critically ill patients in the ED, and the frequency of use of invasive procedures and vasopressor medications by EM physicians. As this patient population is becoming more common in the ED, and with ongoing reductions in access to inpatient beds, ED physicians will likely become increasingly responsible for the care of these patients for extended periods of time. , Strategies to improve both immediate resuscitation skills in addition to post-resuscitation management should be developed in an attempt to optimize patient outcomes. In addition, care pathways for the rapid transfer of critically ill patients from the ED to an ICU setting should be developed by all ED's by engaging hospital administrators and specialists in EM and CCM. Importantly, patient care needs were not evaluated by this survey, so we are unable to comment on the medical decisions in the care of critically ill patients in the ED by our respondents. It is possible that the provision of critical care indicated by our survey respondents were optimal, and that additional invasive procedures and vasopressor medications were not needed. However, based on comparative care provided in an ICU setting and in consideration with current evidence and clinical guidelines, it is possible that some patients did not receive care similar to the care they would have received had they been expediently admitted to an ICU. Indeed, current recommendations advocate the use of information which can only be obtained after invasive procedures are inserted, such as mixed venous oxygen saturation (SVO2). Indeed, recommendations of resuscitation to physiologic endpoints that can only be obtained from invasive procedure related data is a pressing, although incompletely elucidated, strategy in the ED setting. We also did not assess any influence of EM physician billing, although it is possible that remuneration may play a role. Further research is warranted to determine the impact on critically ill patients of ED physician management and delayed transfer from the ED. Despite the limitations of this survey, we report the first data available on the provision of critical care in Canadian ED. Based on our responses, EM plays a prominent role in the resuscitation of this patient population. Additional investigations on the impact of EM physicians on patient outcomes are warranted. Critical care should be viewed as a treatment paradigm, and should not be limited by geographic location. Indeed, future researchers may conclude that care in the ED is the most important determinate in the survival of the out-of-hospital critically ill.
We have found that critically ill patients are common in Canadian ED's, and remain under the care of emergency physician >4 hours while awaiting transfer to an ICU. In addition, emergent airway management was commonly performed by EM physicians, yet other invasive procedures and use of vasopressor/inotropic medications were not. Further research is warranted to determine the impact EM physician care on patient outcomes. The authors would like to acknowledge the CAEP resident research fund for providing support for this study. 1. Manos D, Petrie DA, Beveridge RC, Walter S, Ducharme J. Inter-observer agreement using the Canadian Emergency Department Triage and Acuity Scale. CJEM 2002;4:16-22. 2. Bullard MJ, Unger B, Spence J, Grafstein E; CTAS National Working Group. Revisions to the Canadian Emergency Department Triage and Acuity Scale (CTAS) adult guidelines. CJEM 2008;10:136-51. 3. Fromm RE Jr, Gibbs LR, McCallum WG, Niziol C, Babcock JC, Gueler AC, et al. Critical care in the emergency department: A time-based study. Crit Care Med 1993;21:970-6. 4. McCaig LF, Nawar EW. National hospital ambulatory medical care survey: 2004 emergency department summary. Adv Data 2006;372:1-29. 5. Nelson M, Waldrop RD, Jones J, Randall Z. Critical care provided in an urban emergency department. Am J Emerg Med 1998;16:56-9. 6. Lambe S, Washington DL, Fink A, Herbst K, Liu H, Fosse JS, et al. Trends in the use and capacity of California's emergency departments, 1990-1999. Ann Emerg Med 2002;39:389-96. 7. Bond K, Ospina MB, Blitz S, Afilalo M, Campbell SG, Bullard M, et al. Frequency, determinants and impact of overcrowding in emergency departments in Canada: A national survey. Healthc Q 2007;10:32-40. 8. Bullard MJ, Villa-Roel C, Bond K, Vester M, Holroyd BR, Rowe BH. Tracking emergency department overcrowding in a tertiary care academic institution. Healthc Q 2009;12:99-106. 9. Forster AJ, Stiell I, Wells G, Lee AJ, van Walraven C. The effect of hospital occupancy on emergency department length of stay and patient disposition. Acad Emerg Med 2003;10:127-33. 10. Canadian Association of Emergency Physicians. Position Statement on Emergency Department Overcrowding 2007. Available from: http://www.caep.ca [Last accessed on 2010 Aug 30]. 11. Higgins TL, McGee WT, Steingrub JS, Rapoport J, Lemeshow S, Teres D. Early indicators of prolonged intensive care unit stay: Impact of illness severity, physician staffing, and pre-intensive care unit length of stay. Crit Care Med 2003;31:45-51. 12. Clark K, Normile LB. Patient flow in the emergency department: Is timeliness to events related to length of hospital stay? J Nurs Care Qual 2007;22:85-91. 13. Bur A, Müllner M, Sterz F, Hirschl MM, Laggner AN. The emergency department in a 2000-bed teaching hospital: saving open ward and intensive care facilities. Eur J Emerg Med 1997;4:19-23. 14. Huang DT. Clinical review: Impact of emergency department care on intensive care unit costs. Crit Care 2004;8:498-502. 15. Rivers E, Nguyen B, Havstad S, Ressler J, Muzzin A, Knoblich B, et al. Early Goal-Directed Therapy Collaborative Group. Early goal-directed therapy in the treatment of severe sepsis and septic shock. N Engl J Med 2001;345:1368-77. 16. Nguyen HB, Rivers EP, Abrahamian FM, Moran GJ, Abraham E, Trzeciak S, et al. Emergency Department Sepsis Education Program and Strategies to Improve Survival (ED-SEPSIS) Working Group. Severe sepsis and septic shock: Review of the literature and emergency department management guidelines. Ann Emerg Med 2006;48:28-54. 17. Rady MY, Rivers EP, Nowak RM. Resuscitation of the critically ill in the ED: Responses of blood pressure, heart rate, shock index, central venous oxygen saturation and lactate. Am J Emerg Med 1996;14:218-25. 18. Forster AJ, Stiell I, Wells G, Lee AJ, van Walraven C. The effect of hospital occupancy on emergency department length of stay and patient disposition. Acad Emerg Med 2003;10:127-33. 19. Graff LG, Clark S, Radford MJ. Critical care by emergency physicians in American and English hospitals. Arch Emerg Med 1993;10:145-54. 20. Svenson J, Besinger B, Stapczynski JS. Critical care of medical and surgical patients in the ED: Length of stay and initiation of intensive care procedures. Am J Emerg Med 1997;15:654-7. 21. Varon J, Fromm RE Jr, Levine RL. Emergency department procedures and length of stay for critically ill medical patients. Ann Emerg Med 1994;23:546-9. 22. Yoon P, Steiner I, Reinhardt G. Analysis of factors influencing length of stay in the emergency department. CJEM 2003;5:155-61. 23. Sprivulis PC, Da Silva JA, Jacobs IG, Frazer AR, Jelinek GA. The association between hospital overcrowding and mortality among patients admitted via western australian emergency departments. Med J Aust 2006;184:208-12. 24. Stolte E, Iwanow R, Hall C. Capacity-related interfacility patient transports: Patients affected, wait times involved and associated morbidity. CJEM 2006;8:262-8. 25. Nguyen HB, Rivers EP, Havstad S, Knoblich B, Ressler JA, Muzzin AM, et al. Critical care in the emergency department: A physiologic assessment and outcome evaluation. Acad Emerg Med 2000;7:1354-61. 26. Green RS, Djogovic D, Gray S, Howes D, Brindley PG, Stenstrom R, et al. CAEP Critical Care Interest Group. Canadian association of emergency physicians sepsis guidelines: The optimal management of severe sepsis in Canadian emergency departments. CJEM 2008;10:443-59. 27. Kennedy J, Green RS, Stenstrom R; CAEP Critical Care Committee. The use of induced hypothermia after cardiac arrest: A survey of canadian emergency physicians. CJEM 2008;10:125-30. 28. Burns KE, Duffett M, Kho ME, Meade MO, Adhikari NK, Sinuff T, et al. A guide for the design and conduct of self-administered surveys of clinicians. CMAJ 2008;179:245-52. Behringer, W. and Dodt, C. and Laggner, A.N.